The place hasn't changed much. Seems like I was just here yesterday. Barkeep! Give me a double Rob Roy. Hold the vermouth. 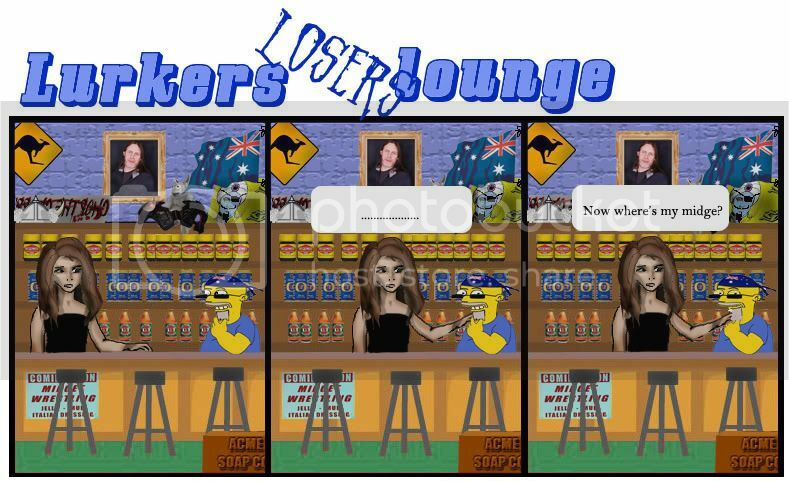 I like it better here in the loser's lounge anyway. A lot of people didn't understand my entry???? A mole is living under the ground and digs holes and paths. This Rooster fell in one of them. The mole is just looking up to see what's happening and why there is this sudden light in his dark home... Maybe I had to shop some more details in. manly the "hole" didn't came up that right, for me. It looked like he is "planted" into earth. Hi Screwloose how are you???? I guess nobody appreciates a nice hat these days..............Give me a long shot of anything strong. I got crushed so badly, I'm not even allowed in the room! I'm actually quite happy to be here. the202's was one of my favorite images of the round and I would have been severely disappointed in you all if you chose mine over his. I wish him the best! Now kittie... I am sad to see you here. Your pic was also in my top 5. At least you can wear the 'misunderstood artist' cloak. Love your style. Hey TX! Doing good here! Oh.. and I understood where ya were going with your Chop! I voted for it! Thanks a lot GdB I really appreciate it. Felt really bummed being so crushed but it makes me feel better to know that. nah, we have a special seat her for you... over in the corner. There is no shame in losing from Starman. You made a cool chop Mr. Butler. It was a nice thouch he wrote your name in the txt: Music by Win Butler! @Kitty, your chop is lovely and arty! I voted with my eyes closed. Too hard to choose. Wonderful creations in this contest. My compliments to all participants!